"The boat was built in 1954 in Hard near Bregenz, using larch wood. I sailed "Lucky Chance" during an apprenticeship in Stockholm and have sailed her crisscross the Baltic Sea, almost reaching Leningrad (St. Petersburg). 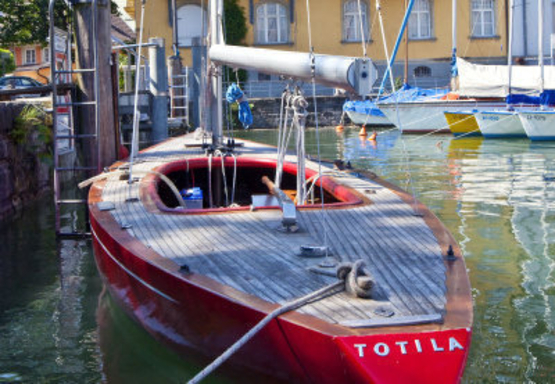 The boat was sold in 1961 and went to Dornbirn and later to Wolfgangsee. Originally she had a cabin and was a doubleender. In international racing in Sandhamn, I had no chances with my cotton sails and was given a set of Ratsay Laptop sails by the American M. Flame. The rigg had to be changed, the calculatiosn were made, at no charge, by Knud Reimers. The cabin was taken off and the double-end-stern was cut off, to meet the right measurenment."